Barry Darnell aka Mobile Slim was born to a boogie-woogie ivory-tickling mother and a construction-working harmonica-playing father in the segregated Southern gulf coast: Mobile, Bay St. Louis, and New Orleans. He eventually moved to Georgia, where he played juke joints and honky tonks all over the Southeast, and sang for spare change on the streets of Underground Atlanta. Ever the rolling stone, he spent several years in Mississippi, where Jesus strummed a funky chord in his soul and inspired Mobile Slim to become a minister of the Lord. He preached in many churches throughout the area, and meanwhile wrote a newspaper column and became active in the Civil Rights movement. But Mobile Slim was still restless. He returned to the blues rhythm he had found in Georgia, this time to Macon, where he continued to make music and live out his groove. Things were pretty mellow, until Mobile Slim suddenly vanished after playing a gig downtown. Some people close to him reported that a few months before his disappearance he became very moody and secretive. He would be gone all night and return at ungodly hours in the morning. No one knew where he went during this time. He had been known to hang with some pretty cool cats at Wild Bean Recording Studio, and one day, a mysterious unlabeled tape was found there, and it was put on the stereo. First there was nothing, and then out came a blast of the funkiest rhythm and blues anyone could ever dream of, a six-course serving of soul food for the soul. They knew immediately what it was: the last known recording of Mobile Slim. Today it has come to be known as “the Return of Mobile Slim” Barry’s first studio album. 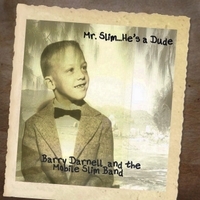 Since that time Barry, umm “Mobil Slim” has returned to the studio and recording a second album “Mr. Slim… He’s a Dude” featuring the same funky blues but coupled with more elaborate horn arrangements and some side trips into southern gospel and even a country inspired tune or two. Barry has proven over the years to be a colorful showman and a more than capable songwriter and performer of the time honored Southern Blues genre.